Even though they're all from the same animal, not all steaks are cut from the same cloth. Here are the best high-protein cuts of beef that won't butcher your fitness goals! Chicken and fish are bodybuilding staples, but once in a while you want to let loose your inner T-rex and dig into a thick piece of steak. After all, beef is high in protein and other nutrients that are undeniably vital to an active body. But depending on the cut you choose, steak can quickly go from a top-notch bodybuilding food to one that's going to sink your clean diet. And it's all because of the calories from saturated fat. How bad can the wrong choice be? Consider that a 12-ounce serving of rib-eye trimmed of all visible fat still has 480 calories from fat alone. Can your diet absorb that kind of punch? Whether you're eating out at a steakhouse or choosing a cut from your butcher, it pays to know your cuts of beef, especially if you're watching your calorie intake to get lean. In fact, don't make the mistake of asking your waiter for the most flavorful cut, which is most likely going to steer you in the wrong direction because of greater amounts of fat. Fat, in fact, enhances flavor. That doesn't mean you have to be stuck with a dry piece of beef, of course. 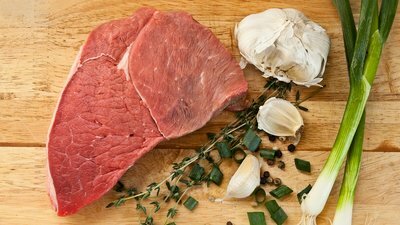 Preparation methods and spices can make or break any cut of steak. But let's start by putting together a list of steaks that show your muscles and midriff some serious love by delivering a better protein-to-fat ratio than their counterparts. In other words, we have no beef with these lean, mean superstar steaks that are a cut above the rest! Bonus: Most of them will also keep your costs down at the grocery store. Yes, fattier steaks oftentimes cost more! Not only is the often overlooked eye of round one of the leanest cuts at the butcher, it can also be one of the most economical. It's taken from near the rear legs, or the "round" part of the beast. Beyond it's a payload of muscle-sculpting protein, this steak also delivers healthy amounts of highly absorbable iron to help give your workouts a boost of energy. Prep Tip: Eye of round can be slightly tough and dry. To help tenderize the meat and add moisture, try marinating it for an hour or more in a mixture of oil, soy sauce, and salt. Prep Tip: You can make a lean cut of steak such as this one even leaner by trimming off the visible fat before cooking. However, leaving on some of the white stuff can infuse great flavor. So consider shedding the fat post-grilling. Gleaned from the loin section of the beast, this cut of steak offers up good flavor and moderately tender meat at a budget-friendly price. So you get the best of both worlds—great taste without the onslaught of fatty calories. As with other red meats, top sirloin is a natural source of creatine, the ultrapopular compound shown to bolster feats of strength on the gym floor. Prep Tip: Lean meats like sirloin can quickly become tougher than shoe leather when overcooked. Your best defense against eating a hockey puck is to cook the steak over high heat not past medium-rare, about 3 minutes per side. Similar to top round, this steak is taken from the rump region of the animal. Each 3-ounce serving ponies up nearly 20 grams of top-notch protein that your transforming muscles crave, along with healthy amounts of selenium, a potent antioxidant that may aid in exercise recovery. Prep Tip: Since this cut is not praised for being overly tender, it's a great candidate for braising or slow cooking in some liquid over a longer period of time to help tenderize the meat. If you're looking for a steak with rich, beefy flavor that won't break the fat bank, look no further than skirt steak. This long cut of steak is sourced from the diaphragm muscles of the beast. Prep Tip: Skirt steak is best pan-seared or grilled over high heat and makes an outstanding fajita, sandwich, or stir-fry meat. Cooked skirt steak should be sliced across the grain to help break up the tough fibers. You don't have to completely cut these steaks out of your training diet, but their lofty fat numbers should make them more of a splurge than a regular gastronomic occurrence.